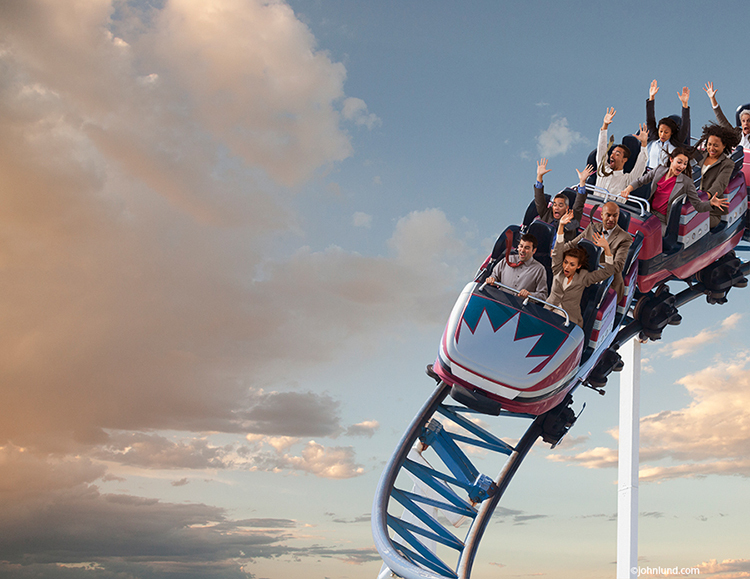 A roller coaster filled with screaming business people hurtles down a track in a humorous business stock photo. Like roller coasters, businesses have their up and downs. The Stock market certainly has its ups and downs. Every industry goes through its cycles, and there are a lot of businesses that offer products, services and guidance to help both individuals and businesses, small and large, to either avoid, weather or even thrive on the up and down challenges they are sure to face. It makes perfect sense then to create imagery that such businesses can use to advertise and promote those products and services, and images that magazines, blogs, and online news services can use to illustrate their offerings around such issues. It was with exactly that need to illustrate those ups and downs of business that prompted me to create an image of a rollercoaster populated with terrified, screaming executive type business people in the middle of a rapid descent. The message is clear and a quick read even at small thumbnail sizes and the image stands up to large reproduction including billboard sizes. I composed the photo to allow for cropping to square, vertical or horizontal formats while allowing ample copy space for headlines, body copy, and even inset photos. Part of what makes a successful image is the ease and flexibility with which it can be used by art directors, graphic designers and photo editors. Another aspect of this photo that works to its advantage as a stock image is that there really isn’t much to date it. Roller coasters will probably look like, well, roller coasters for a long time, and casual business attire doesn’t really change much either. Another important aspect of the image is fun. The inherent humor helps the image be memorable and compelling. To create this business concept image I first went to an amusement park and photographed a roller coaster, focusing in fairly tightly on the first two cars. I specifically looked for cars that were mostly empty to facilitate the Photoshop work I would have to do. The next step was to find the nine models I would need, which I did using SF Casting.com. I had each model come in to the studio and photographed them from a ladder to get the correct perspective. As long as I had them I also photographed each of them for a series of other images I knew I would be making…have to be efficient these days! Each model was hired for $35.00 an hour digital files for their portfolios, with a two-hour minimum. I had a list of at least a dozen scenarios for each model. It took about a day in total to do the Photoshop work. I stripped each of the models out by making a clipping path, turning the path into a selection, refining the selection using the refine brush on the hair. I put them into the roller coaster cars using puppet warp for small positioning adjustments. I also used a sky that I had photographed years earlier in the desert (while at Burning Man…everyone should go once). Because it is the type of image that I think can be used by a large audience for multiple uses I put it into BlendImages as a Royalty Free image. Who the hell named RF images Royalty Free any way? But I digress. This rapidly descending roller coaster car filled with terrified executives could be a poster image for the stock photo industry! As an aside, we stock shooters have to remember that like a roller coaster, if we hang on long enough we should be fine. This image has been licensing well for a couple of years now (and seldom fails to sell at least once a month). Someday I will check on the revenue and be pleasantly surprised to see that it has earned many thousands of dollars…at least that is what I am planning on…in the mean time…I am hanging on for dear life!